On occasion, it’s nice to go back to basics. Wheat Flour, Water, Vegetable Oils, Humectant (Glycerol), Wheat Fibre (2%), Sugar, Wheat Germ (1%), Emulsifiers (E471, E472e), Salt, Raising Agents (E450, E500, E296), Flavouring, Preservatives (E282, E202), Stabiliser (E466), Flour Treatment Agent (E920). Look at all of those E numbers! Add the oil to the water then stir into the flour using a wooden spoon or your hands until the dough comes together. Tip out onto a floured surface knead for 5 minutes until it becomes smooth. Set aside for as long as you need to make the fillings (at least 15 minutes). 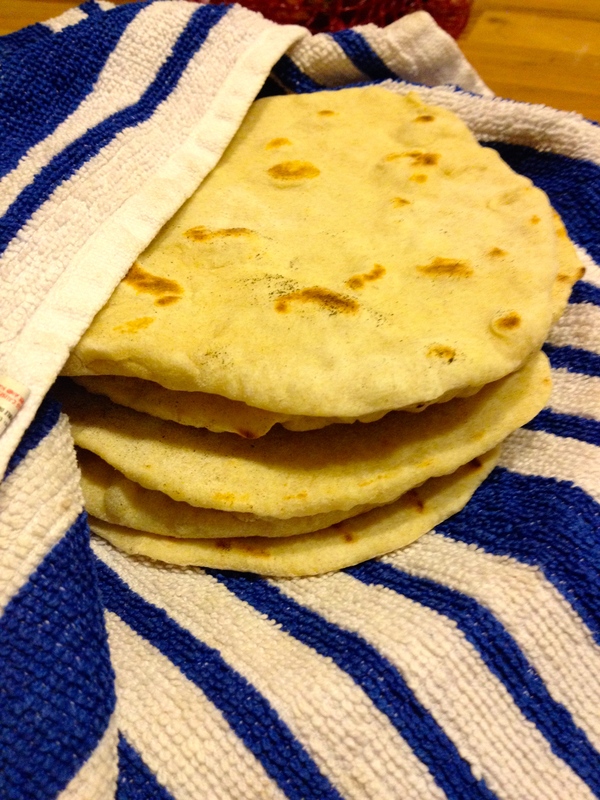 When you are ready for them, divide the dough into 8, roll into rounds 2-3mm thick using flour so they don’t stick and cook in a dry frying pan or griddle for 2 minutes on each side.Wrap up in a tea towel to keep warm until you have cooked them all. This is another recipe from the River Cottage Every Day cookbook and I use these all the time. They’re great for fajitas, although I’d aim for 4 bigger wraps rather than 6-8 smaller ones, or accompanying mezze dishes. We have also had these with spiced lamb burgers, lettuce, cucumber and spiced yoghurt or last night we crammed them full of falafel, tomato salad and sweet chilli jam. Get wrapping! 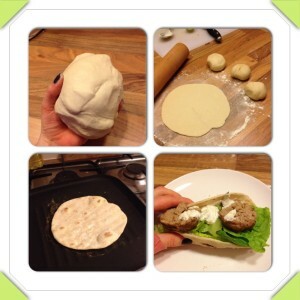 Posted in Good foods, Recipes and tagged bread, dinner, flatbread, lunch, snack, wraps. Can you use any type of flour for these? could you make them gluten free with rice flour for example? Rice flour doesn’t work (just tried it! ), there is nothing holding them together. Gluten-free flour like Dove’s Farm flour should work just fine as they replace the gluten with things to make the flour hold together. Alternatively I would recommend buckwheat crepes, which can be used like wraps. Recipe to follow!